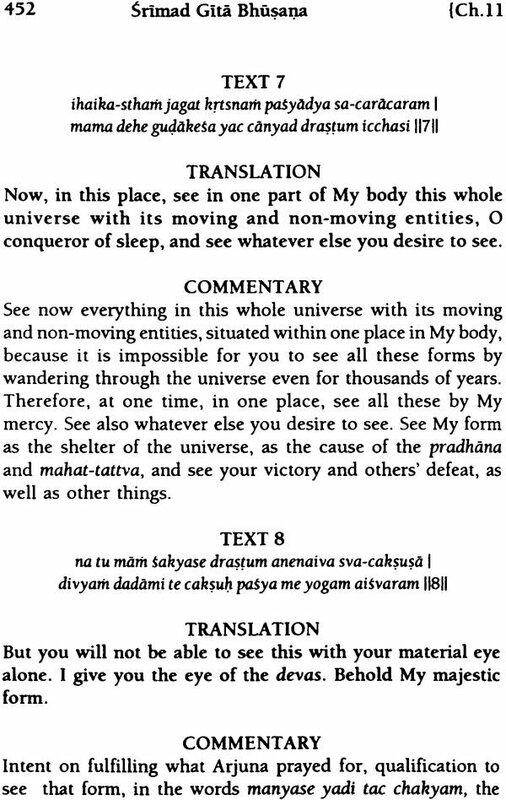 "With care, Vidyabhusana has attended upon this commentary called Srimad Gita Bhusana. O devotees who are greedy for the sweetness of prema of Sri Govinda and who are filled with mercy, please purify this work." Srila Baladeva Vidyabhusana. 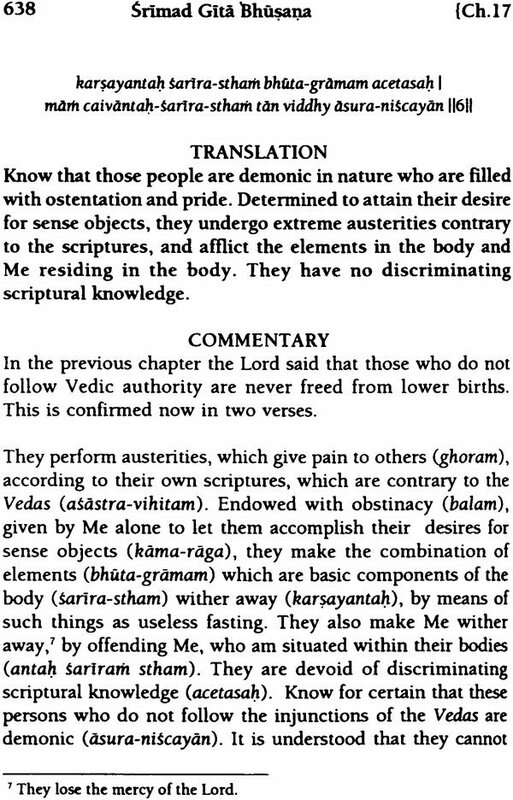 One can ask why did Srila Baladeva Vidyabhusana consider it necessary to write a commentary on the Bhagavad-gita, when shortly before that his siksa guru; Srila Visvanatha Cakravarti Thakura, had written an excellent and original commentary perfectly in harmony with Gaudiya philosophy. His personal answer to that question we will never know. 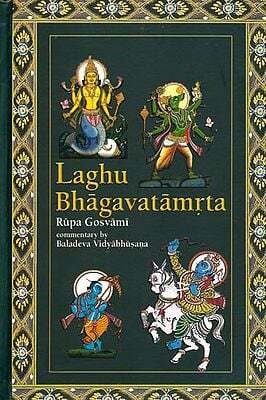 However, by examining his commentary, Gita Bhusana, the reader will be able to appreciate that he has indeed made a significant contribution to the study of the Gita in writing it. 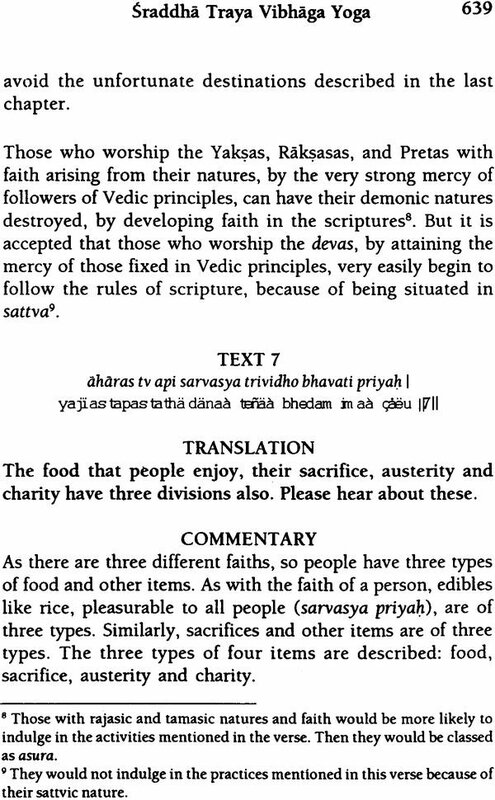 Like Srila Visvanatha Cakravarti's, his explanations are unique and consistent with the whole of the Gita, and yet his commentary is quite different from Visvanatha's. At the same time, the explanations are in harmony with the Gaudiya philosophy. Thus, we have two equally brilliant commentaries on the same text. Both conclude the supremacy of Krsna and pure bhakti, but with different explanations of the verses leading to that conclusion. Within one sampradaya, we have two differing explanations of a work, both of which we accept as correct. Inconceivably, the two commentaries are different but harmonious. However, we will also find original ideas in his commentary. He presents the concept of three types of devotees: the sanishta, parinisthita and nirapeksa in order to bring unity to the whole of the Gita. The sanistha bhakta follows the gradual process: niskama karma yoga (varnasrama), followed by jnana yoga, astanga yoga, and finally bhakti yoga. 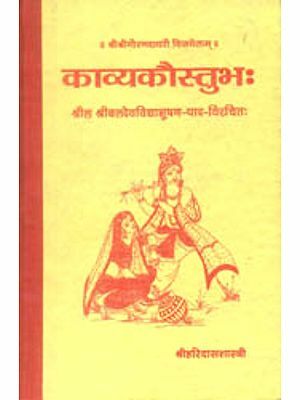 Thus all the processes described in the first six chapters can be considered essential for the sanishta bhakta's development. The parinisthita bhakta directly engages in the devotional processes of hearing and chanting as his main sadhana. He also performs varnasrama rules, but without attachment, only to set an example for less advanced persons who do not have strong faith to practice bhakti as their main sadhana. 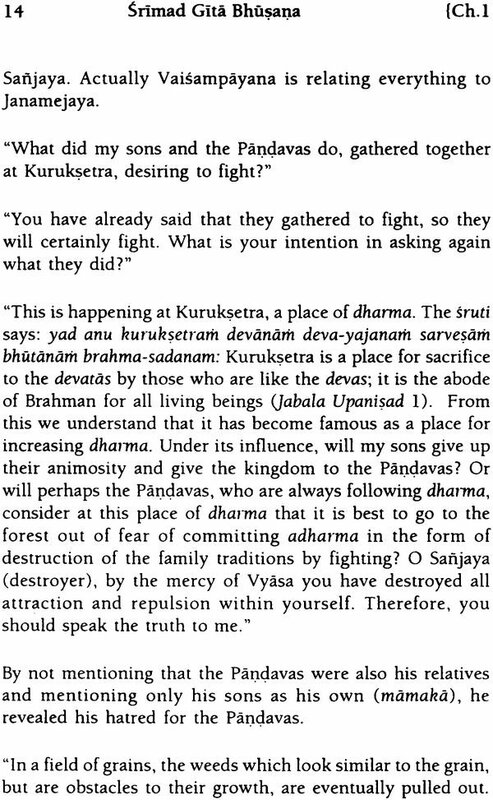 The nirapeksa bhakta performs only bhakti and rejects the rules of varnasrama. He is usually a renounced person. The latter two types of devotees are called ananya bhaktas or pure devotees, though they are practicing sadhana. They are considered superior because of their direct practice of bhakti. These two types are described in the middle six chapters, and at the conclusion of the Gita. This explanation of the relationship of varnasrama to bhakti may be useful to readers for application in their own lives. In producing commentaries, the authors often resort to explanations of the words of the verse in their grammatical context within the sentence, while at the same time explaining the words' implied meanings in the context of the subject at hand. This often gives rise to long, complex sentences which become difficult to follow in English, but are quite clear in sanskrt. Such sentences have been broken up for easier comprehension, though in the process, the explanation of the grammatical context may disappear. Please bear that in mind while reading. Comments or explanations of the commentary are usually in footnotes. Please forgive any mistakes in translation or interpretation. I hope the reader will find the commentary stimulating to the intellect and nourishing to the soul, bringing about greater faith and devotion to Lord Krsna. May my mind remain eternally fixed on SrI Govinda, who is the ultimate perfection of real, infinite, inconceivable powers, and who thus controls everything; who is expert in protecting His devotees; who is also the root of creation, maintenance and destruction of the universe; and who is full of bliss. I offer my respects to the Gita, which was spoken by the Lord endowed with perfect qualities. It is a work by which the ocean of ignorance meets its complete end,' by which pure bhakti becomes fully nourished to the highest degree, and by which, the supreme truth, normally difficult to understand, becomes eternally manifest. Svayam Bhagavan Krsna, condensed happiness and knowledge, is the Supreme Person endowed with inconceivable power. His feet are the object of meditation by Brahma and others, who create, maintain and destroy the variegated universe in accordance to His order. Through such pastimes as His birth, He gave exceeding joy to His associates, whom He treated equal to Himself, and who appeared with Him. And by His pastimes He liberated many jivas from the tiger's mouth of ignorance. Wishing to deliver others in the future, after His own disappearance, He placed Arjuna, whom He considers His own Self, under seeming bewilderment at the commencement of the battle by His inconceivable energy. 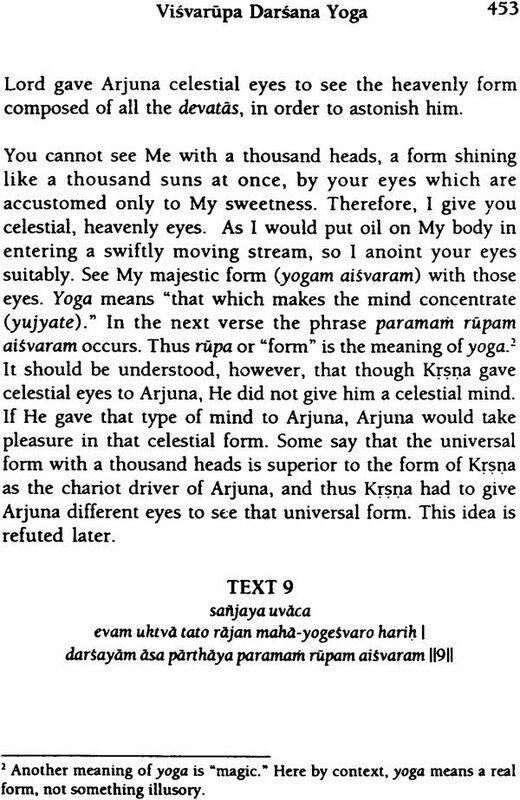 Then, on the pretext of removing Arjuna's ignorance, He spoke to Arjuna His own Gitopanisad, which excellently ascertains the real nature of Himself and His energies. Five subjects are described in the Gita: Isvara, jiva, prakrti, kala and karma. 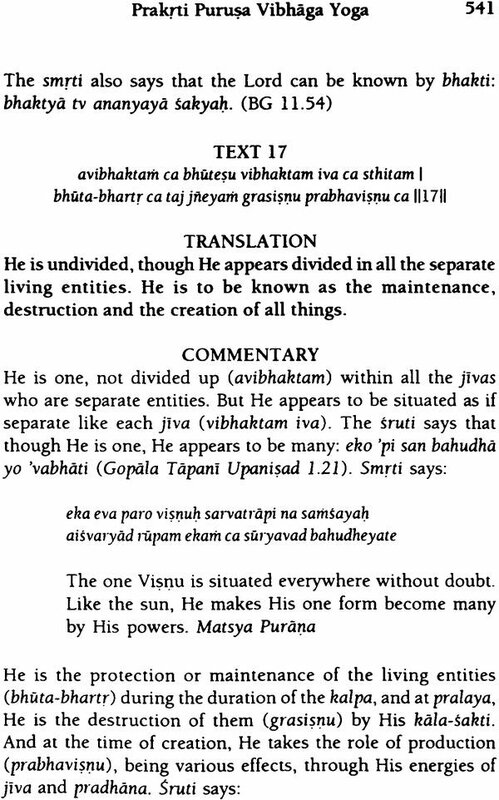 Among them, the all-powerful conscious being (vibhu-samvit) is the Lord, Isvara. The minute conscious being (anu-samvit) is the jiva. Prakrti is that substance which is the shelter of the three gunas: sattva, rajas and tamas. 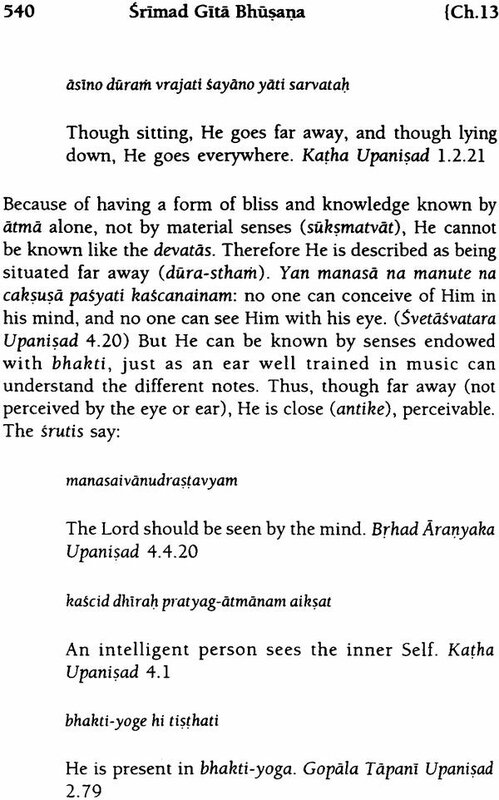 Kala is unconscious substance (dravya) devoid of the gunas. 2 Karma refers to the force of destiny produced from the actions of men. Thus, the Lord is proved to be both a doer and experiencer (karta and bhokta) from the use of the words sarva-jna, servavit, boddha and karta. The equivalence of knowing with experiencing (or enjoying) is recognized by all, as in the following statement. This statement makes clear the equivalence of the two words "knowing" and "enjoying." A person will become a jnani, remembering the Lord, by performance of niskama karma. To do otherwise creates only obstacles. Karma or action has two parts like grain with its husk. As the rice is superior to the husk, jnana is superior to the gross part. Those fixed in understanding the meaning of the Vedas achieve Svarga and eternal liberation. There are many methods, but among them, surrender (prapatti), along with the attitude of being a servant, quickly pleases Visnu.